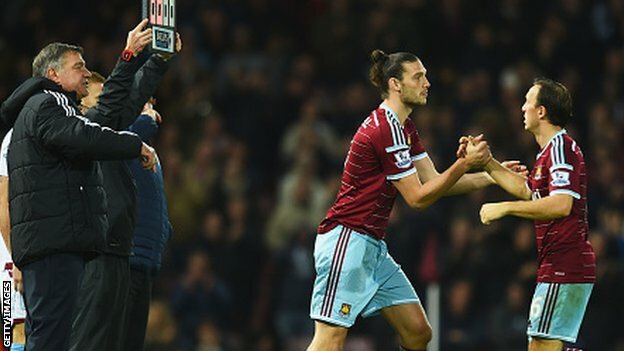 Hopes were high as The Hammers entertained their struggling opponents under the lights at the Boleyn. Newcastle were not having the best start of the season ever, but WHU were yet to register a point at home, whilst taking full points on the road at Arsenal and (historically) Liverpool. Since that game at Anfield, some 4 players have joined WHU and one made his debut last night as Victor Moses came in for Obiang, and Tomkins found himself once more in the right back berth. Mark Noble also made his first appearance as officially the club captain, although with the fans he has held that position since Scott Parker left. As is usual for WHU the game started to drift and although we maintained the attacks, we were not really making the best of our chances. The Newcastle No.8 Vumon Anita was playing as a one man defence and was stopping everything and everyone coming his way. We continued as is now usual to half time, content to be ahead but not really pushing. But it must be said we were playing further up the pitch than normal and not buggering about passing it around the back. It made a change not to go in 2-0 down at home, so happy days. Once again we started the second half with the wind in our sails attacking the Bobby Moore. We cleared an early attack from Newcastle to Moses who ran the whole length of the pitch and got himself in on goal. He shoots, beats the keeper, but not the bar. The rebound comes straight out to Payet who volleys it in to make it 2-0. Big shout to the the team here, as Payet ran off on his own to celebrate, everyone else was congratulating Moses, who had his head in his hands ! From here on, Payet ran the show and gave us his full set of tricks and passes. This started to breed confidence within the team and soon everyone was at it. Against a better team we may of suffered , but Newcastle could not capitalise on the showboat circus. Even Mark Noble was taking people on and getting crosses in. There were back heels and fancy passes all over the place. The crowd were loving it, but occasionally you could see where the loss of the ball could reduce the deficit easily. The biggest cheer of the evening was reserved for the reintroduction of Andy Carroll (again), who nearly picked up a yellow card with his first touch (or non touch as it was on Tim Krull). His five minute cameo ended the night perfectly. The crowd were chanting “Are you watching Allardyce” for the last few minutes in between cheering on the back flicks and nutmegs. On a side note, Kevin Nolan was on Goals on Sunday this weekend and spoke glowingly of the club and his time there. With the stick people (myself included) have given him for the last 6 months, fair play to him, especially having his boy in a WHU kit. In parting, good luck to him in his future endeavours. So in short, we have a top, top, quality flair player in midfield,backed up with some steel, we can pass balls all over the shop without fear, we score some tremendous goals, we can defend and attack in numbers, we are all in it together, and are always on the edge of going too far and screwing it all up. 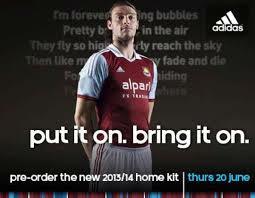 THE WEST HAM WAY IS BACK !!!!! MOTM: Payet, big shouts to Moses, Kouyate, Noble, and Tomkins. Slaven Bilic’s Claret and Blue Army ! Is a straight line really that hard lads ? Welcome back, and stay bloody fit ! After our win over Man City, most WHU fans were thinking that the next 2 games against Stoke and Villa should be 6 points and our top 4 status should be secure. However, old skool heads knew better, and those thoughts were realised after our draw at Stoke (albeit from 2 nil down), and another 1 point game with our 0-0 against Villa yesterday. Last year we would of lost by 3 or 4 at Stoke and maybe could of thrown away the valuable point late on yesterday. Let’s not forget this point moved us back into the top 4 (without at this time knowing the Arsenal result). These results have been recognised with Sam getting Manager of the Month for October and Diafra Sakho getting Player of the Month. Villa are a team in trouble, and played that way. They spent the last half hour wasting time and if it wasn’t for some great goalkeeping would of lost to our last few minutes onslaught of their goal from the returning Andy Carroll. WHU played the whole game in control with Downing (congrats on the England call up) and Song running the game from start to finish. The introduction of Carroll was immense, and if he had come in for longer (eg when Cole came on), we would of got a win. However that wasn’t to be and we have to learn that teams respect us more these days and sometimes we will be up against spoiling tactics. That all said some players need to take a look at themselves. Kouyate for example, is a player that prior to his injury had been a Diame with the ability to surge forwards and link up play. His introduction back in yesterday for Amalfitano (who was poor against Stoke) was welcomed but he really didn’t deliver. Against a tight midfield, he was ineffective and looked a shadow of the guy who started the season. In fact, he looked like Diame ! The one worry for me, was that with Valencia and Sahko not firing yesterday, we ended the game with Cole, Nolan and Carroll on the pitch. Will Sam start to revert to these tactics that saw him vilified last season if we go on a run of draws and losses? We will have to wait and see. Carroll as previously mentioned looked immense when he came on. In the 5 minutes he played, he had 2 chances saved by Guzan . I think he will be introduced in longer spells moving forwards, and the upcoming International break will help with his recuperation. Our next two games are away to Everton and home to Newcastle. Neither will be easy ,and will be a good bell weather for our finishing position for the season. But we cannot deny, that with a fully fit squad we should now be prepared for anything, and the competition for places should encourage better performances. Shout out to Joe Cole who took some humorous “banter” well, while warming up for Villa. On that subject, fans singing “he hits who he wants” to James Tomkins might want to think about that. MOTM today was again Alex Song, but big shouts to James Collins who played a blinder against his old team. Holidays and bad timings of games will limit my reports until late December now, but hopefully, I will still have the optimism brought on by he opening quarter of the season. Last season Man City beat us 9-0 over 2 legs in the League Cup semi final and won the premier league, as well as the cup. Today was a test of how far we have come since then, with the new look team and style. Anything short of a hiding would be an improvement over previous encounters. Sam had suggested this was a good time to play them with their mid week trip to an empty stadium in Russia behind them, and I tended to agree. It worked for our Liverpool game ! Both teams lined up pretty much how you would expect, and the Song / Toure match up seemed a mouthwatering prospect. The ground was packed to the rafters, and for a change the atmosphere was electric and expectant. We actually thought we could win. Personally I thought if we could keep them quiet for half an hour, we may have a chance. However City came out of the blocks flying, and as i thought he would be, Silva was dictating the play, and laid a couple off to Aguero which another day, would of had a different result. We coped with the onslaught by having Song cover every blade of glass, and drive his fellow midfielders on to get back and help out as well. One example was our attack breaking down, and City countering quickly. He must of run 70 yrds to collect the ball off the toe of Dzeko in our box. After a long 10 minutes we started to get the ball and actually play. We were pushing them back and stopped them playing. Cresswell and Jenkinson were pushing their overlaps further and further back assisted by Sakho and Valencia getting among the back four to stop any counters being launched. This set the tone for the rest of the half. One loose ball came to Song who threaded a world class ball through for Valencia out wide on the right. He went round Clichy and got to the byline to cross a simple ball avoiding Hart for Amalfitano to tap in to open the scoring for the Hammers. Crowd go wild with chants of “we’re going to win the league”. One nil West Ham. City did not recover and at half time WHU were quite comfortable with their lead. 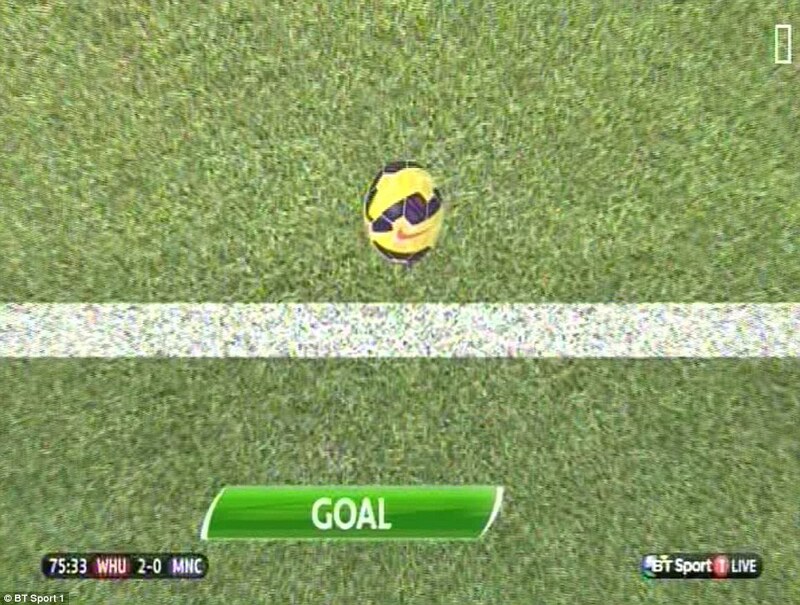 The second half was more closing down by WHU high up the pitch, and we started to believe. But you knew we needed at least one more goal. This came on 75 minutes with the ever impressive Cresswell getting down the line to cross for Sakho to head into the corner, and the ball was scraped out by Hart. From my angle, it wasn’t in, but it’s not up to me, and the lino and the technology adjudged it to be over (see photo above), and Sakho gets his 7th in 7 starts. 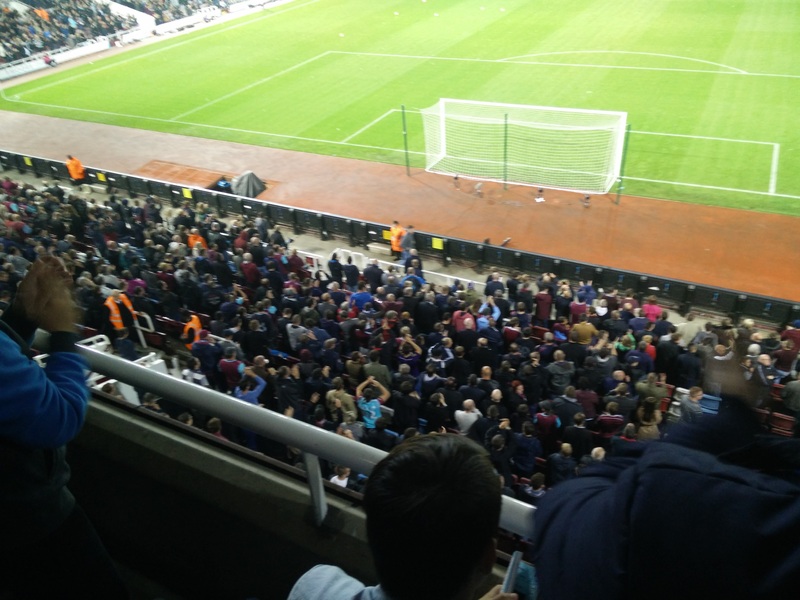 Roof lifts off the ground, and WHU fans start doing the “Posnan” much to the chagrin of the City supporters. 2-0. Literally from the kick off, Silva shows his quality, by running through half our team to slot in a great goal for City, and set up the finale. Anyway, all told, WHU won and we really deserved it, and that is the important part. The team has been upgraded, we have had a little injury scare, and brought squad players in, and we are still doing well, and find ourselves in 4th, and it’s not a false position. Will we stay there? Probably not, but with Stoke and Villa up next, we dare to dream with some justification. As much as it pains me to say, Sam has had more than a shout in this, but he needs to deal with this with humility (not a strong point) and not ram it down the fans throats. MOTM was Song by a mile. If we can change the loan to a permanent move, it could up Sam’s relationship with the fans immeasurably. A bit of an odd one. As Chelsea, Arsenal, Totts and these two London clubs were all playing in the capital yesterday, our games kicked off at 16.20? A new one even for Sky. 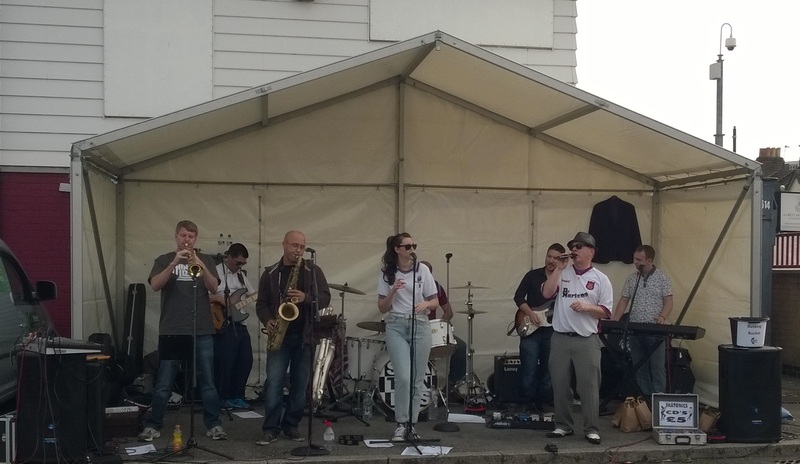 Arriving in Green Street wasn’t quite the same as Wembley Way for the NFL, but we did have a band in the car park. Some good old Ska from the SkaTonics who were covering Guy Lombardo’s (and latterly Prince Buster’s and The Specials) Enjoy Yourself. Being a bit of a 2 Tone man myself, I stuck around for a couple of tracks and then headed in with a spring in my step. Diame on his way ? Just happy to be at Upton Park ! 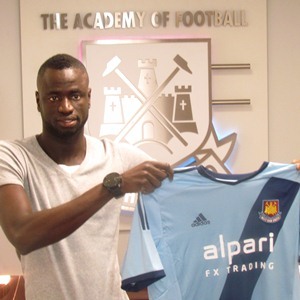 Today, WHU announced the signing of Cheikhou Kouyate from Anderlecht. I will admit I’m no expert on the guy but he does seem a Sam signing. A 6’4″ midfielder from Senegal who has some experience of European competition during his time in Anderlecht. 3 goals in 145 appearances suggests that he hasn’t been signed as part of Sam’s new “attacking project” or as a replacement for Kevin Nolan. Mark Noble’s performances this last season makes him a shoe in for the first 11. This means in my estimation, with the amount of midfielders we have available means that at least one will be going. That one, in my estimation will be Mo Diame, who lets be honest, hasn’t torn up any trees this year, and I think we all agree needs new challenges and unfortunately needs to be off of our payroll if he doesn’t want to be here. Such a shame, as some of his performances have been fantastic, but he seems to have a little of the Adebayor’s about him, now he’s settled. So Merhbe (welcome in Wolof) Cheikhou, and may your stay be good ! Also the fixture list is out. Totts at home first game. At least we can start the season well ! 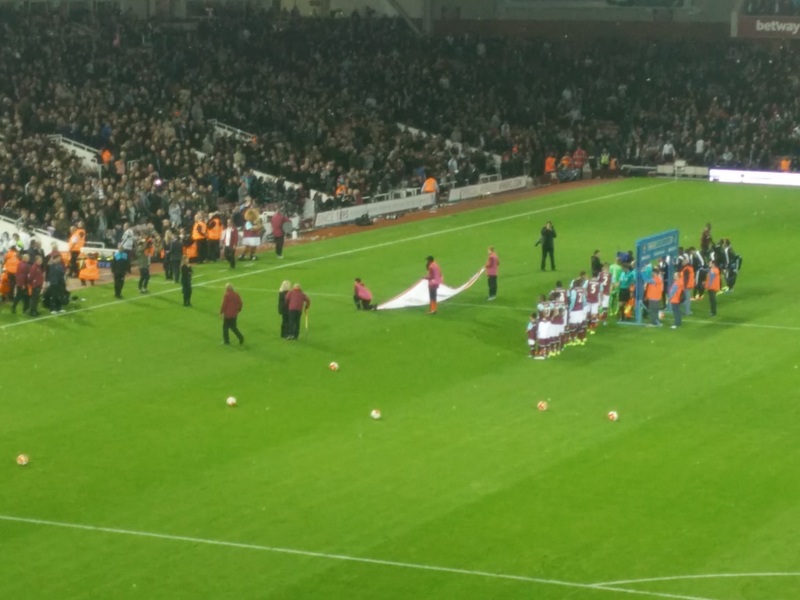 WHU – where next ? So, the season has come to an end and the Hammers ended up in a respectable mid table position. Despite the dreadful football exhibited by Sam and the team this year. Where do we go? This close season has delivered some great rumors (Ashley Cole), some poor ones (Rio Ferdinand), and some outright hilarious ones (Emile Heskey ?). The signing of Mauro Zarate is obviously a cheap tactic for the board and manager to protest their new brand of attacking football. What’s the chances he turns up and sits on the bench, watching Carroll flounder around on his own for another season. Where does this leave Carlton Cole? As he hasn’t followed his namesake Joe out of the door, I assume he stays and sees out his remaining one year around the bench and the last 10 minutes. Talking of Joe , I for one will go on record and say he did not deliver this time around, and I for one was disappointed. Sam got one thing right, JC was simply not fit enough. Villa are taking a massive chance on giving him what surely must be his last chance. With Joe in the taxi (c. V Paradis) was George McCartney and Jack Collison. Jack was no surprise, as he didn’t really add anything , and since his career threatening injury a couple of years ago, he is just not a premier league player. But he is WHU through and through, and his open letter to the fans was truly sad, especially his reminisces of that Millwall game. George going was interesting as currently there are no ideal replacements in the team unless Joey O’Brien is being favoured (really ?). Bring on Ashley Cole I say, or maybe Evra if he gets replaced at United as they talk about doing it nearly every season. As part of this new look attacking team (LOL @ Sam), we need someone who is a real attacking midfielder. Nolan has cost us more than he has delivered in the last year, but will not leave all the time Sam is there (but he’s not in the photos for the new kit, so you never know). Who is this person we need? How about Ravel Morrison (remember him ?). Didn’t get a game for QPR either when it mattered, but we all know what he can do. If Sam is the manager he thinks and says he is then he has to sort this out. However if Fergie and ‘Arry couldn’t then maybe it is a lost cause. In that case I bring you…..Jack Rodwell. Wasting his time at City, and with probably more big players coming in , that won’t change anytime soon. This is also the upcoming season to blood some of the Academy properly, and not in the way it was done this year, by exploiting them in the FA Cup. This coming season for the club is critical, being the penultimate season at the Boleyn. We cannot be trying to get promotion before the big move, or worse still, move in while we are in the Championship. Just unthinkable. I would also be looking to shift some more deadwood (RVT and Stephen Henderson) and someone who played like a dead wood, Mr Mohammed Diame. It’s a shame, the lad has everything, but cannot be arsed to do it for us, and keeps banging on about Liverpool. So do us all a favour mate and piss off. Normally i would review the season but it was one to right off. I will issue my player of the season though. Once again unexpected (for me), after the surprise of Winston Reid last year, this years recipient is Mark Noble. Not only did he carry himself well all season he also carried Diame and Nolan at times as well. Well played Sir. Special shout out to Adrian, who came into a team in disarray, let in double figures in his first 2 games (none his fault), and then turned in performance after performance. Good lad. That’s me for this season unless any big news happens before the start of the season. But like the Euro’s i will be doing a little right up of the England games as they happen in the WC. Guess that will keep me busy for 2 weeks !